The Tao of Gini: Tell me when.. 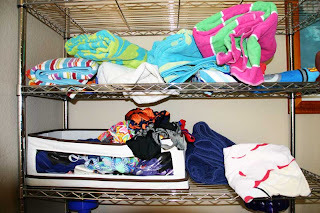 When is my kid's OCD going to kick in? 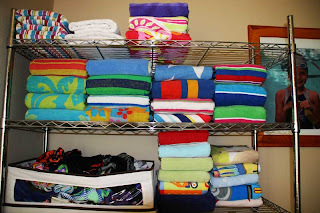 Now, I am not asking that the swim towels be organized according to color, size, place purchased, year bought, or that like-colored towels be next to each other, while keeping them all in alphabetical order by color, or anything crazy like that. Ahhhh....very pleasing to the eye. The second picture, that is. Not the first one. That one hurts. I think your kids are inspired by me. Drives my wife nuts too.